The map shows the curvature of Carmarthen Road. In the 1990s a by-pass was made creating two parts to the road, "old & new". (WGA) N/A N/A 1819 This section of the road was not completed until 1819. At the licencing sessions William Grey was described as the owner occupier. (C) F56 DISASTERS AND ACCIDENTS, ACCIDENTS, MINING ACCIDENTS 1856 May 02 Inquest Travellers Well Swansea: David Jones aged 52 Killed at Weig Fawr colliery. (C) H34 BUILDINGS, COMMERCIAL BUILDING, INNS, PUBLIC HOUSES, HOTELS, SOCIAL CLUBS 1856 September 12 Neath sessions: licenses - David James, Travellers Well, Cwmdu; Ann Stanford, Dock Tavern, Briton Ferry. 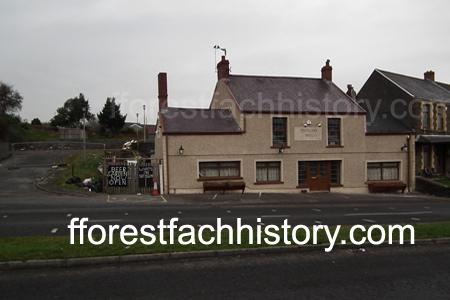 (C) Q18 CRIME AND PUNISHMENT AND POLICE, ASSAULT OR THREATENING BEHAVIOUR 1879 April 04 Swansea Police: John Driscoll not guilty of assaulting PC Smith outside Travellers Well public house, Cwmbwrla. (LIC) N/A N/A 1885 George Lewis was the landlord. (LIC) N/A N/A 1889 Mary John was the landlady and the owner was Ann Lewis. P532 KELLY'S DIRECTORY 1891 Cwmbwrla. Commercial. John Mary (Mrs.), Travellers' Well P.H. (LIC) N/A N/A 1900 Buckley Brewery took over the ownership . 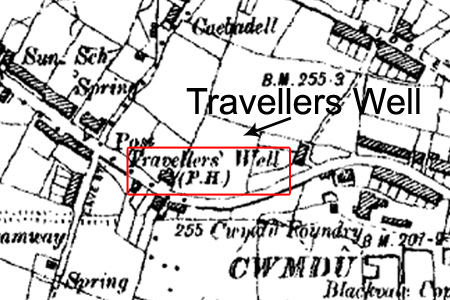 Traveller's Well, Fforestfach. Good accomodation for cyclists. John Lewis. John Lewis was the landlord. (LIC) N/A N/A 1917 Sarah Ann Lewis was the licence holder. (LIC) N/A N/A 1920 Sept George Glyn Hill was the licence holder . (SWDP) C10 DEATHS, DEATH NOTICES 1920 Sept 06 September 5, Travllers Well, Cwmbwrla, Swansea, Sarah Ann Lewis wife of of late John Lewis, aged 54 years, burial at Box. (LIC) N/A N/A 1927 Gertrude C Hill was the landlady. (LIC) N/A N/A 1939 Gertrude C Rees was the landlady. (LIC) N/A N/A 1949 Apr Ethel May Kedward was the landlady and still was in 1962. (LIC) N/A N/A 1953 Simonds Brewery Ltd was the owners. Double Licence = Beer and Spirit Licence. also been pulled down. The rising ground behind now supports numerous private dwellings erected during the 1960's),." N.L. Thomas, Swansea District and Villages - Cwmbwrla p.6, printed 1969.